Kanye West is changing his name! The 41-year-old rapper announced on Twitter on Saturday morning (September 29) that he wants to be known simply as YE. Kanye is prepping for his performance on Saturday Night Live later this evening and also the release of his new album Yandhi, which will drop today. There are rumored to be several special guests joining Kanye for the SNL peformance. Kim Kardashian & Kanye West Take Daughter North to Sugar Factory for Her 5th Birthday! Kim Kardashian and Kanye West are having a fun-filled family day to celebrate daughter North West‘s birthday! 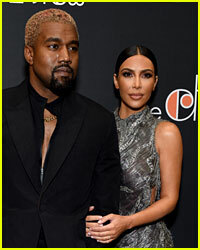 The 37-year-old Keeping Up With The Kardashians reality star and the 41-year-old ye rapper were seen taking North to Sugar Factory on Friday (June 15) in New York City. Kim, Kanye and North went to Sugar Factory following a nice lunch at Cipriani, where they were joined by friend Jonathan Cheban. They also made a special pink purchase for North. Find out what she got for her birthday!